Author, podcaster, success story and all around awesome guy Jimmy Moore has a terrific new (and much needed!) 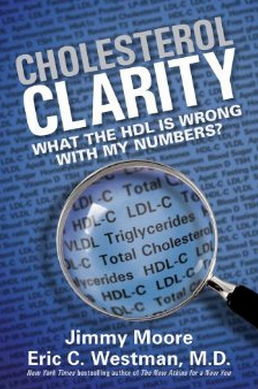 book out about cholesterol called Cholesterol Clarity (co-authored with Dr. Eric Westman). Jimmy used to weigh 400 lbs and take all sorts of medications including cholesterol-lowering drugs before turning his health around with eating low-carb. He’s experienced firsthand some of the bitter side-effects they can cause. Check it out for yourself and don’t let another day go by that you don’t understand how valuable cholesterol is and what those numbers on your blood test really mean. Dissolve 4 cups of baking soda in a regular size tubful of water as hot as you can tolerate. Use more as needed if your tub is oversized. Stay in the bath until the water has cooled which will take approximately 45 minutes. Do not rinse after the bath – simply towel dry. 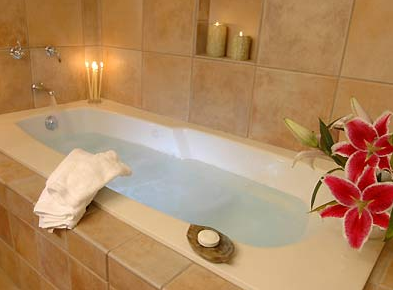 Dissolve 2 cups of epsom salts in a regular sized bath. Use more as needed if your tub is oversized. The temperature should be comfortably warm but not overly hot. Soak for at least 12 minutes and up to 20-30 minutes. Rinse and towel dry. Dissolve one pound of sea salt or rock salt and one pound of baking soda to a regular sized tub of water (more if the tub is large) as hot as you can stand it. Stay in the bath until the water has cooled which will be about 45 minutes. If the bath is too hot, you can add some cold water if this is the only way you can manage to stay in for at least 30 minutes. Don’t ever add more hot water after entering the bath, however. Add 2 cups of pure apple cider vinegar to a regular sized tub of water as hot as tolerated. Use more as needed if your tub is oversized. Stay in the bath until the water has cooled which will be about 45 minutes. Towel dry and don’t shower for at least 8 hours. Be sure to only do one bathing formula per day and don’t mix ingredients. If you are pregnant, consult with your healthcare practitioner before trying any detox baths. Enjoy one or more of these baths 1-3 times per week! 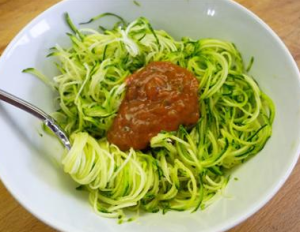 Also called zoodles or zucchetti, zucchini noodles made with a spiral slicer are a fun, fork twirl-able staple food for anyone looking to add a nutrient-dense, gluten-free/grain-free, Paleo compatible noodle into their meals. You will need a spiral slicer like this one to create long, thin strings. “This recipes requires a spiral slicer. This is a tool worthy of investment if you are serious about being grain free. Slice ends of zuchinni off and slice zuch in half. 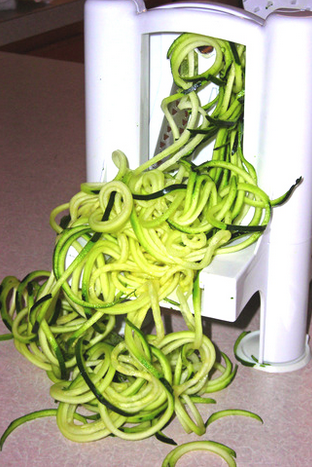 Then insert each half on the spiralizer and use smallest triangle blade for small noodles. Rotate until all of zuch is used, repeating for each zuchinni half. Cook on low-medium heat in olive oil for 10 minutes. 1 zuch per person. OR bake in the oven on a tray lined with paper towels (to soak up moisture) at 250 for 20 mins. 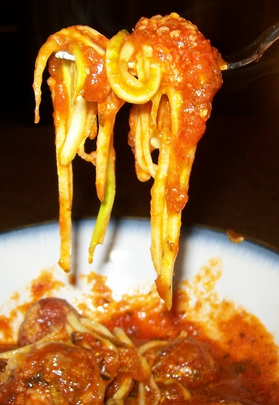 Top this with pesto, sausage, and fresh tomatoes or a homemade tomato sauce. It’s as simple as that! You can spiral slice sweet potatoes for homemade fries, cucumbers, apples, etc.